Many drugs have an effect on driving. Some, such as alcohol and cannabis, can slow reaction times, reduce the ability to concentrate and distort the judgement of time and distance. Others, such as cocaine, may lead to people taking more risks. Prescription drugs too can affect our ability to drive. You have legal (including prescription) drugs in your body that have impaired your driving. You have ‘over the specified limits’ of illegal drugs in your blood, even if these do not appear to have affected your driving. they aren’t causing you to be unfit to drive even if you’re above the specified limits. The blood levels given for illegal drugs are very low but were set at a level to rule out accidental exposure. Similar to drink driving, the police have a roadside test that makes it easier to detect those who are driving under the influence of illegal drugs. 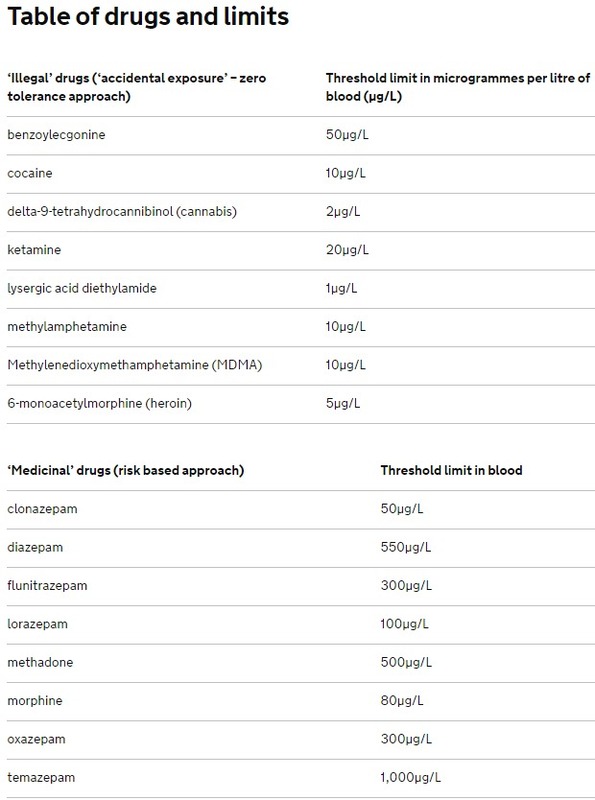 The Release website has a table with information about how long the drugs might remain in your system. Error: Error validating access token: Session has expired on Saturday, 03-Nov-18 03:39:19 PDT. The current time is Friday, 19-Apr-19 14:12:21 PDT.